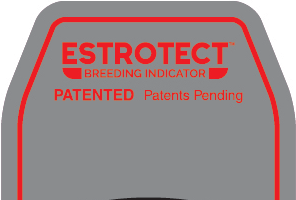 Redesigned ESTROTECT™ Breeding Indicator features patent pending Breeding Bullseye that indicates when cows are ready to breed, helps confirm pregnancies and signals timing for AI protocols. Spring Valley, Wis. [October 1, 2018] – ESTROTECT™, the global leader in innovative breeding management tools, today announced the release of the new ESTROTECT™ Breeding Indicator. The ESTROTECT™ Breeding Indicator features a new and improved precision design that includes the patent pending Breeding Bullseye™ to help producers and breeding specialists know exactly when animals are ready to breed. The ESTROTECT Breeding Indicator takes all the guesswork out of the breeding process. It’s the first product of its kind to serve a variety of uses, including heat detection, confirming pregnancies, identifying potential embryonic loss and pinpointing timing for various modern AI and breeding protocols. Third party university research has demonstrated that when the new ESTROTECT Breeding Bullseye (or the equivalent amount) is rubbed off of the patch by mounting activity, the confirmed pregnancy rate for those cows was up to three times higher than those where the Breeding Bullseye was not rubbed off. 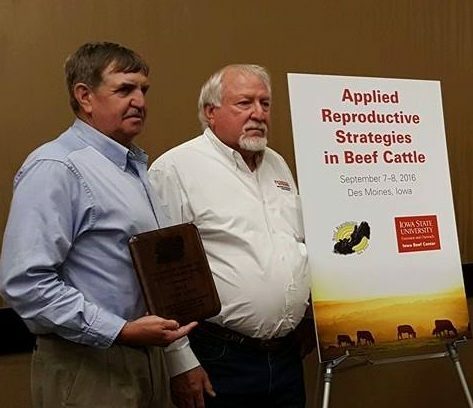 With a missed or failed pregnancy resulting in lost revenues anywhere between $42 and $126 per cow, the economics of utilizing the ESTROTECT Breeding Indicator for breeding success has never been clearer. Separate university trials tested ESTROTECT Breeding Indicators in extreme conditions across three different breeds of cows in the United States and South America. When the Breeding Bullseye was activated, those cows had 30-day pregnancy rates that were up to 180 percent higher than those bred without activated ESTROTECT Breeding Indicators. Just like the original ESTROTECT patches, the ESTROTECT Breeding Indicator has a unique, self-adhesive design with rub off silver and now new black ink. When cows experience mounting activity, ESTROTECT’s silver and black surface ink is rubbed off by the friction of mounting activity to reveal one of five indicator colors – red-orange, green, blue, yellow or fuchsia. When the black Breeding Bullseye (or the equivalent amount) is rubbed off, it is time to breed the animal. Sunday morning the AI Industry lost a real pioneer. Stan Lock was a real cowman that understood the science and practical aspects of breeding cattle by artificial insemination. Stan will be missed but his work will go on through his disciples.